We ensure that all our staff are genuinely committed to our vision of providing the highest quality of care that shows respect for all individuals and their unique needs. All new staff that join Meadow Lodge Home Care Services are put through an induction programme which is based around but vastly exceeds, the Minimum Standards for the caring industry. Once this programme is completed, the care staff will register for their NVQ in care at varying levels, depending on their individual backgrounds and experience. The Meadow Lodge Home Care Services management team also attend courses so that they develop professionally and can offer up-to-date advice, information and support. 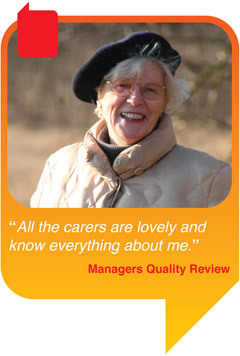 Meadow Lodge Home Care Services is committed to delivering a consistent quality service. The aim is to offer continuous improvement, ensuring effectiveness, efficiency and value. This is achieved within a framework of equality and values that promote the rights and desires of our service users. We believe that no matter how good our present service is, there is always room for improvement and that every member of staff should demonstrate a total commitment to quality and quality improvement in every aspect of their work.